Want To Create A Space Symphony? Wait For A Solar Storm Although you can't hear anything in space, scientists can still use sound to understand the solar system by turning data collected by NASA satellites into sounds and music. Listen to how one sonification specialist creates music out of eruptions on the sun. In photo from the Solar and Heliospheric Observatory, a major solar eruption is shown in progress Oct. 29, 2003. 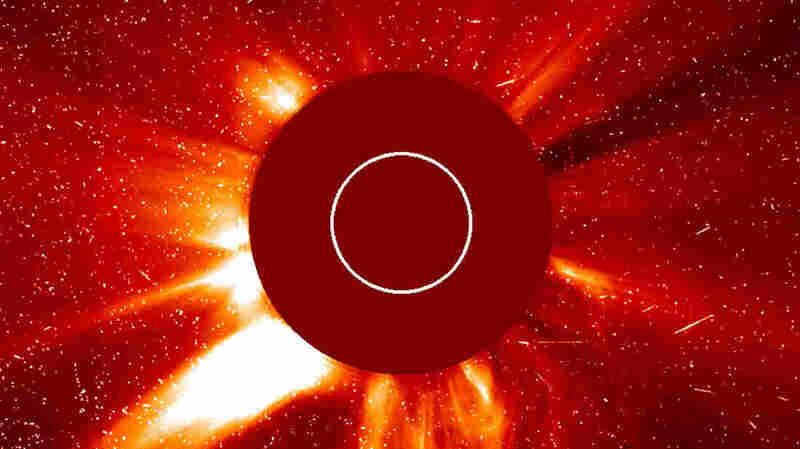 A large coronal mass ejection is being hurled toward the Earth. In 2001: A Space Odyssey, Stanley Kubrick evokes the immense and powerful nature of outer space with Richard Strauss' score, Thus Spoke Zarathustra. The music is now inextricably linked to the idea of space exploration. But what if, instead, you could create music from solar eruptions? That's exactly what sonification specialist Robert Alexander does. Although you can't hear anything in space, scientists can still use sound to understand the solar system by turning data collected by NASA satellites into sounds and music. Alexander, who works at the Solar and Heliospheric Research Group at the University of Michigan, spoke to Jacki Lyden, host of weekends on All Things Considered, about what's behind some of the solar music he has composed. Listen to some of the sounds Alexander has created through a process called sonification. "Solar Heartbeat" starts with raw audio data. Alexander's filter is then slowly applied, so the low frequency hum of the solar rotation is more audible. "There are a lot of things like solar flares or coronal mass ejections, and these things have the potential to knock out satellites and disrupt the power grid. And, so, when we think of the sun as a very dynamic and turbulent system, when we listen to the unfiltered and the raw data, that's what we're hearing. We're hearing the raw turbulence of the sun." While the clip above depicts the filtered and unfiltered sounds of the sun, Alexander also uses his work to compose music. One of his compositions uses different voices to depict the charged states of carbon. "The charged states of carbon tell us something about the temperature and the energy coming off the sun," Alexander says. " So, it really lends itself to sonification. ... We're always going to have a sort of natural sense of balance between these voices." Another of his compositions reflects a significant moment in solar history, known as the Halloween Storms of 2003, which NASA described as "some of the most powerful solar storms ever recorded." "There's this really large increase in this sort of wind sound that I've generated, and also a swelling in the voices," Alexander says, describing how he transformed the storms into music. "We also get this sense of expanse and ... when we get this huge swell in the data is [when] the velocity of the solar winds jumps up. And we have this huge variance in so many of these variables." You can hear the dynamic changes of the sun in Alexander's music, including this symphony, which he composed with elements of solar data. The high bell tones represent solar eruptions. Alexander says he hopes that translating the sound of the sun into audio can help us understand and better relate to the solar system around us.